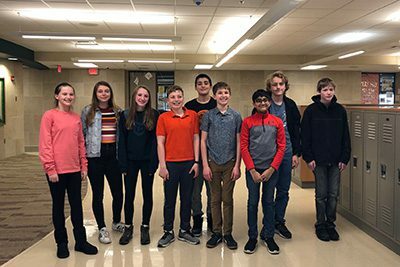 Congratulations to the Middle School Quiz Bowl team who competed in the GEMSTONE Middle School Quiz Bowl Tournament in Burnsville this past weekend! MPA A (Anthony T., Sophia S., Aidan H., and Gabe M.) finished 3rd out of 40 teams. MPA B (Akshay S., Maya A., Molly V., Ben M., and Ian F.) finished 5th out of 40 teams, which qualifies them for the NAQT National Tournament in Chicago in May. Additionally, out of 183 players, Akshay S. placed 5th (Trophy Winner), Anthony T. placed 13th, Gabe M. placed 22nd, and Ben M. placed 33rd. Way to go, Panthers! Good luck at the National Tournament in May!